Prolific producers of new work, Victorian Opera again caters for family audiences with The Pied Piper, an original composition by Artistic Director Richard Mills. As a contemporary opera sung in English, The Pied Piper is a well-chosen companion piece for the French-sung reduction of Massenet’s Cinderella (Cendrillon), staged just two short weeks ago. The thought of children attending the theatre and learning to appreciate the classical voices, live orchestra and stylised story telling of opera is too exciting for words. Beautifully produced, the opera again features the attractive set and costume designs of Candice MacAllister. 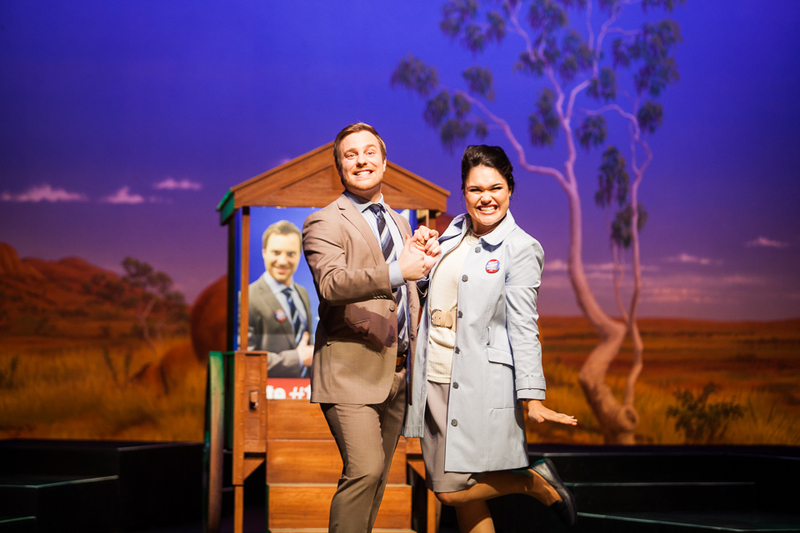 Production values are high, with sturdy scenic elements and a beautifully painted Australian landscape backdrop. Costumes are colourful, with animal characters cutely suggested by their headwear. The large ensemble has clearly brought along their own clothes, and the selections fit into an attractive colour palette of shades of blue. Joseph Mercurio’s lighting design adds to the visual appeal. When the lights start flashing red and rats start crawling across the stage, wide-eyed children sit up and pay attention. The extra element that sets this season apart is that the production will tour Victoria, with significant community involvement along the way. 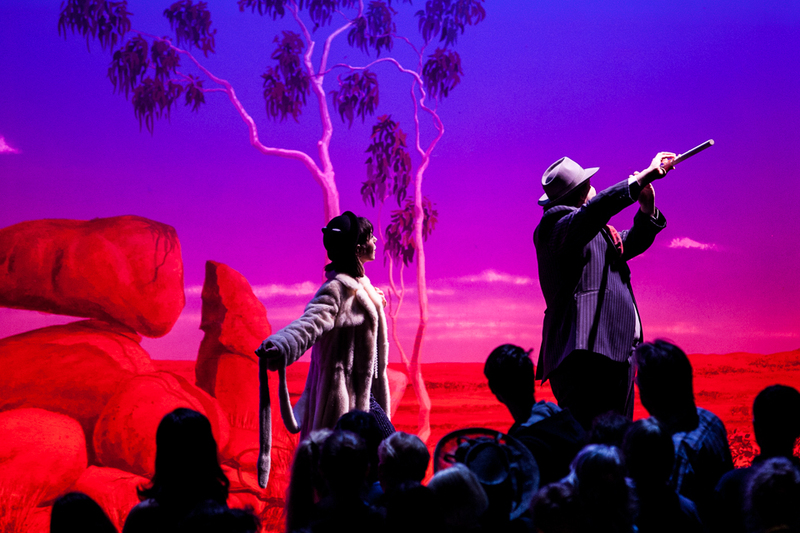 The highly focused Melbourne cast features 30 children, playing enthusiastic school children and creepy crawly rats, and 45 adults of all ages. The massed vocals have a polished, appealing sound; indeed, Mills’ finest musical sequences involve the full company singing contrasting vocal lines with choral accompaniment. Conductor Simon Bruckard leads an orchestra of seven musicians in a well rehearsed and prepared performance that belies the brand new nature of the work. Another highlight of Mills’ music is the lovely flute passages, which the Piper mimes on stage with his outsized pipe. Director Derek Taylor keeps the storytelling crystal clear and makes excellent use of the space in arranging some 82 cast members. In terms of the sort of lively energy needed for compelling children’s theatre, Taylor is somewhat hamstrung by the rather solemn nature of Mills’ work. This style worked magnificently in the gorgeous Christmas pageant The Play of Herod but tends to work against a sweet, colourful tale such as The Pied Piper. An element that always engages young viewers is the inclusion of a villain, and The Pied Piper is well served by the gleefully avaricious pair of Mr and Mrs Mayor. 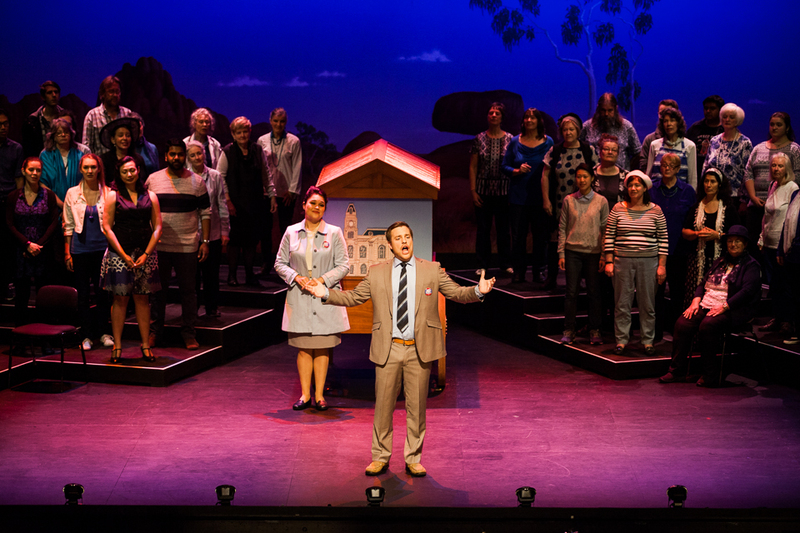 In one of his last Australian appearances before commencing a year of training at the Wales International Academy of Voice, outstanding baritone Nathan Lay delivers another expertly judged, splendidly sung performance as Mr Mayor. Fleuranne Brockway is a delightful comic partner as Mrs Mayor. 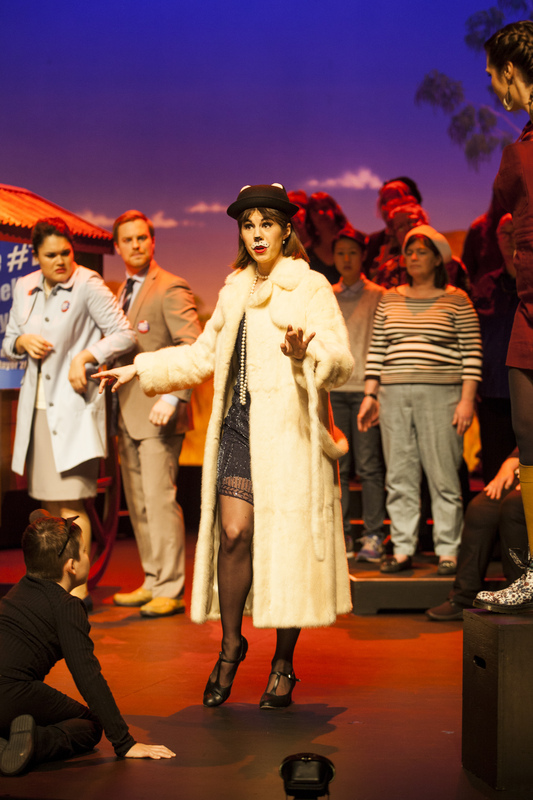 Positioned in the middle of the Children’s chorus, Lisha Ooi does an excellent job of leading the singing while still blending in with her young co-stars. As General Rat. Ooi’s voice shines through beautifully. In a witty touch, Carlos E. Bárcenas brings a touch of the exotic to the Pied Piper by singing in his native Colombian. Bárcenas’ imposing stature adds to the impact of the title character. In a delightful performance that is perfectly pitched to the young audience, Stephanie John plays the Piper’s Cat, who translates his words for the town. Jacob Lawrence, so memorable last year as The Grumpiest Boy in the World, has a solid presence in the small but narratively significant role of the Town Crier. Sopranos Kirilie Blythman, as popular sweet seller Beatrice Brittle, and Elizabeth Barrow, as wise teacher Rosemary Sprig, complete the quality cast of developing artists. The Pied Piper does not reach the heights of The Magic Pudding, which remains the gold standard of Victorian Opera’s recent output of original children’s operas (followed quite closely by The Grumpiest Boy in the World), but it is a pleasant, accessible piece that continues the fine tradition of introducing children to the world of opera. 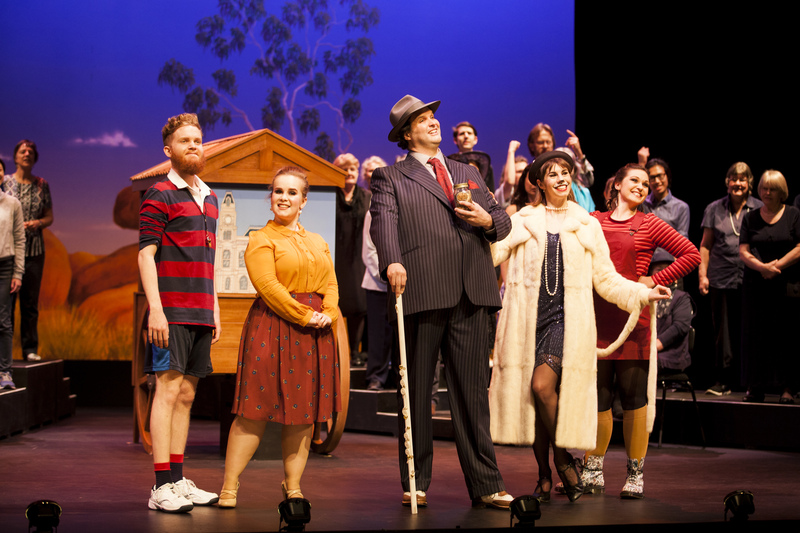 The Pied Piper plays again at Playhouse, Arts Centre Melbourne on 30 July 2016 before touring to Port Fairy, Mildura, Warragul, Bendigo, Shepparton and Albury/Wodonga. Approx 20 years ago I took my then 7 year old darling daughter plus four friends ranging in age from 8 to 5 to a superb production of The Barber of Seville at the Athenaeum. We had front row seats in the circle. I had great difficulty stopping the five of them throwing themselves over the balustrade in their enthusiasm. It was a delightful production, and – I hope – for those children an appreciation of opera that will be with them forever. Wonderful story, thanks for sharing! I hope your darling daughter still enjoys opera today. Seeing a classic like The Barber of Seville is an ideal introduction, and I am so impressed the Victorian Opera have taken the quest even further by creating original works. She does – so do her companions, several of whom are now wonderful musicians.